I heard distant rumblings about Sharon Santoni from her first book, My Stylish French Girlfriends, then she was featured in the May/June 2018 Victoria Magazine, sharing with us her just-released second book, My French Country Home, and her gracious taste in French country living in Normandy, France, and I was hooked. Sharon Santoni grew up in England, fell in love, married a Frenchman, raised their four children in a rural dream home and cultivated garden, and embraced her French life. Soon to be an empty nester, Santoni got the idea to start a blog, My French Country Home, sharing her daily life in rural France and all that it offers. Fast forward, her blog is now read by thousands all over the world, two beautiful books under her belt, and an accidental entrepreneur with her quarterly subscription mail order Stylish French Box. From spark to fire, sometimes life is like that! She muses frequently about reinventing oneself, lessons we can all learn from her. If that is not enough, Santoni loves to troll nearby brocante flea markets for unique treasures for her home, garden, and entertaining. She is my kind of girlfriend! Last August 2016, I finally found myself outside the hallowed Chez Panisse Restaurant and Cafe in Berkeley, California. Founded in 1971 by Alice Waters and a few other like-minded friends, the food principles that perpetuate this eating establishment have changed our food culture forever in this country. Alice Waters, food activist and food icon, has taught has us the value and pleasure of eating locally, supporting our artisan farmers, eating seasonally, supporting food sustainability, and igniting the concept of school gardens for our children. I meet Alice Waters at Chinos Farms, part of their Good Food, Great Chefs events for the celebration of her latest cookbook, The Art of Simple Food II. Over the years, Alice Waters has mentored many talented floral designers, talented chefs, and cookbook authors such as David Liebowitz and Joanne Weir who worked, trained, and enhanced their careers at Chez Panisse. Alice Waters has influenced me. She has that gift to inspire and motivate others. When I read food books about Paris and Provence, occasionally I run across her name and presence. The week after I visited Thomas Jefferson's Monticello, Alice Waters was actually cooking in Thomas Jefferson's kitchen for an event. She has inspired me to grow as much of my own food as possible, be sustainable, and eat seasonally. Cafe Water Carafe Etched "Chez Panisse"
Lunch was delightful and delicious, needless to say. The entire time I kept savoring details of lunch, the table, the clientele, and the setting. I share with you now Alice Water's Creamy Meyer Lemon Dressing I had that special day over bright green billowy bibb lettuce . Makes about 1/2 cup. This is a creamy dressing that coats lettuce in a luscious way. The flavor is light and sprightly filled with lemon juice and zest. Alice Waters especially likes it on sweet lettuces such as butterhead or romaine or a mix of small chicories and radicchio. Stir together in a large bowl: 1 Tbsp. Meyer lemon juice, 1 Tbsp. white wine vinegar, grated zest of 1 Meyer lemon, salt, and fresh-ground black pepper. Taste and adjust as needed. Whisk in: 3 Tbsp. extra-virgin olive oil, and 3 Tbsp. heavy cream. Taste for salt and acid and adjust as needed. Lunch in Provence Cooking Classes! I Have a Place Setting for You and Friends! Many thanks for everyone's interest and enthusiasm in the "Lunch in Provence" Cooking Classes. Perfect to treat yourself, a special friend, or loved one for a birthday, milestone, or to just experience a relaxing day in South France. There are still a few place settings available for the Thursday, October 6, 2016 "Autumn in Provence" cooking class and the Thursday, November 10, 2016 "Que Syrah, Syrah" cooking class, see FALL CLASS SCHEDULE DETAILS. Many thanks to my local 92024 Magazine, January/February 2016, for their "Flora, Floats, and Fun" article on page 42. Their recognition highlights how I was chosen to ride Scotts Miracle-Gro float in the 2016 Tournament of Roses Parade, with it's special California Grown certification. I've been a resident of Encinitas for over thirty years, and know how much flower growing has been a rich part of Encinitas history. The sandy soil and temperate climate were ideal for flower and bulb growing. I was thinking of my Encinitas community on Rose Parade Day, honored to be representing my community, California home gardening, and symbolically bringing a little bit of Encinitas from my own garden, in the form of olive tree branches, rosemary, and lavender foliage to be on the float along side me. In hot pursuit of cold rosé wines, my husband, John, and myself found ourselves in the fairytale region of southern Provence near the Bandol area. It is breathtakingly beautiful much, like the lower Rhône Valley with medieval hilltop villages and rugged rolling landscapes, with the blissful addition of the glistening Mediterranean in your sight. We stayed in the hilltop village of La Cadiere-d'Azur, where some of the village's defense walls date back to the 13th Century still stand. By recommendation we stayed at the Hotel Bérard, a quaint family-owned and managed hotel that also boasts a Michelin-starred restaurant. In fact, father, René Bérard, and his son, Jean-François are the chefs. In my research I noticed on their website, Bérard Hostellerie, there was a property in a garden setting, La Bastide des Saveurs, in which they offered cooking classes, sommelier food and wine pairings, and special events. I innocently asked if we could see the garden at La Bastide des Saveurs--thinking it was a grand vegetable garden. The tour was arranged and the next morning Chef Rene Berard personally met and escorted us the three kilometers to his property. Yes, La Bastide des Saveurs was a grand vegetable garden or potager and so much more to my surprise and delight! It proved to be one of the most beautiful gardens I have ever seen, mixing herbs, flowers, and vegetables together. Typical of a potager is a focal point, pathways, and divided parts of garden planted in herbs, vegetables, and flowers. 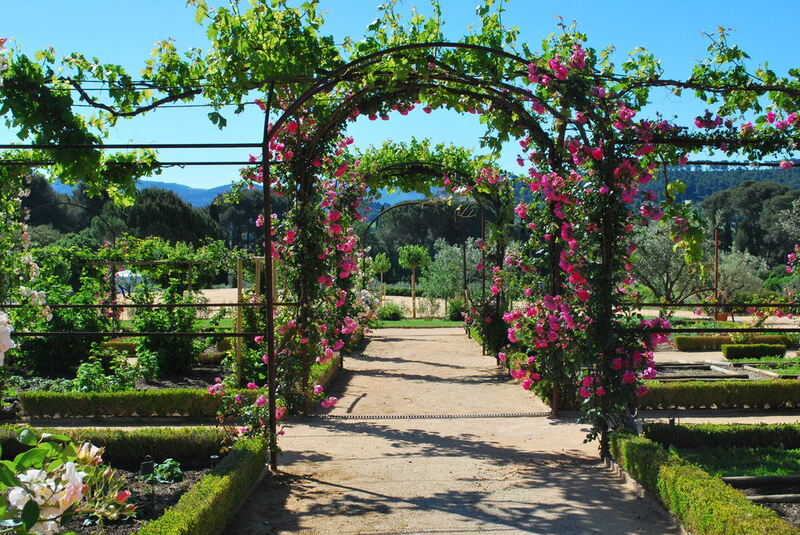 Arches of happy blooming roses billowed along the pathways. I saw one of my favorite climbing roses over and over in full glory, the lovely Pierre de Ronsard, or better known in the United States, as the climbing Eden rose. Chef Berard was so gracious to detail and explain how he used these herbs and vegetables in his cooking. Chef Berard speaks a bit of english, and I speak a bit of french, but we were definitely speaking the common language of "cooking from the garden." On this beautiful morning, the light and landscape added dramatic drama to this incredible garden. I thought to myself, this must be one step away from heaven. Chef Berard showed us how he plants many different varieties of tomatoes, and how he successfully stakes them individually, and anchors them with end poles. I must try and find this tomato pole for next year's growing season. Everything was spectacular about this property, down to the Provencal fountain holding court amongst the olive trees, lavender, and iceberg roses. I highly recommend looking into cooking classes at La Bastide des Saveurs. Chef Berard will customize cooking classes for a group of six or more. You can find more detailed information at Hotel Berard. Not quite over jet lag and time difference, with my head still drifting back to special moments, my husband and I have just returned from an incredible spring visit to Provence and Paris. Towards the end of our trip on a rainy Sunday in Paris (rain makes Paris even more romantic) I noticed this "larger than life" quote in a Marais pastry shop window. Translated it means "The earth is a cake full of sweetness." Charles Baudelaire was considered one of the most influential French poets in history, and one of the greatest poets of the 19th Century. He was also a critic, essayist, and a translator. When I saw the quote I immediately thought of my beloved Provence. That's it, Provence is so full of sweetness, the landscape smiles back at you. Not only is the landscape so utterly breathtaking, everyday life is colorful, food and wine are exceptional, and the unexpected becomes the norm. It is simply the magic of Provence and all of it's sweetness. I have so much more to share with you regarding Provence, please stay tuned. What do garden bloggers like better than writing about gardening and plants? They like gathering in verdant places like Seattle, The Emerald City, experiencing new gardens. and joining the "sisterhood of garden bloggers" across the country. Okay, there were a few fellas in the mix, too. This year's garden blogging conference, dubbed Seattle Fling, was a compilation of nearly 80 gifted garden writers who pen their passions about all things gardening. A "Who's Who" of multi-talented voices naming off plant names like a foreign language. It is a diverse group, not just for the climatic regions they represent, but how they hail their expertise. Some are Generation X, with soon-to-be-released garden books under their belts. Some are forefront blog sensations who can proudly say they have almost a decade of posts and writing in their arsenal. Some are veteran garden writers and speakers, well known in this country's garden circles. This phenomenon of garden bloggers and writers gathering together magically happens once a year, usually in July. Last year it was in Buffalo, New York, serendiptously coinciding with Buffalo's Garden Walk. Next year's 2012 event is tentatively planned to be held in Asheville, North Carolina. Garden bloggers attending this year's Seattle Fling 2011, experienced a well-planned and orchestrated itinerary of private and public gardens, retail garden shops and nurseries, a David Perry photography workshop, West Seattle's Sunday morning Farmers Market, and a spoiling by garden-related sponsors. Garden bloggers were treated to this unique concrete "ruin creation" by Little and Lewis in a wooded private garden. The concrete leaf fountain now moss-aged with water and time, was originally molded from an actual Gunnera leaf. A trip to the picturesque waterfront Olympic Sculpture Park featuring 21 works by world-renowned artists was both captivating and breathtaking, capturing the essence of Downtown Seattle on one side, and the beauty of the Olympic Mountains and Puget Sound on the other. VintageGardenGal wishes to thank everyone involved in this year's Seattle Fling 2011, and embraces her fellow garden bloggers.